Two-time defending Euro champion Spain looks to become the first nation to ever three-peat, France hopes to cash in on home-soil advantage, and much more in our mega in-depth Euro Cup preview. As hosts, France will look to repeat the success home field advantage helped them achieve in winning the 1998 World Cup and Euro '84. Coach Didier Deschamps was the captain of France in '98 and leads a talented squad with quality players sprinkled all over the pitch such as Paul Pogba and Antoine Griezmann. The biggest question mark resides at the forward position, after star Karim Benzema was excommunicated from the squad for his involvement in an alleged plot to blackmail France teammate Mathieu Valbuena, a decision confirmed by French football federation in April. Nevertheless, if Les Bleus can hold up at the back there is no reason to believe a title run is not in their future. Romania's qualification was a shock, not only because up to this point they had appeared in only one international tournament (Euro 2000), but it was also in the fashion they did it in. Qualifying unbeaten, no side allowed less goals than the Tricolorii, with an absurd two. Their offense on the other hand? Downright offensive, with no side scoring fewer than the 11 they were able to muster. The Swiss are led by promising young players, many of them with immigrant backgrounds, such as Stoke's Xherdan Shaqiri, who is of Kosovar descent, as is new Arsenal midfield signing Granit Xhaka. A surprise run to the Round of 16 in the last World Cup has provided optimism, but if their qualifying play was any indication of what’s to come, few of Europe’s elite would tremble at a potential matchup. Taken’s Marco of Tropoya put his country of Albania on the map with his famous phrase of “good luck”, and that's precisely what their men's soccer team will need now as well. Led by Italian manager Gianni de Biasi, the Albanians qualified for a major international competition for the first time in their history. Goalkeeper Etrit Berisha and defender Elseid Hysaj -- both of whom play in Serie A -- will be relied upon to recreate the magic that saw them beat Portugal in qualification, earning the entire squad Albania's highest civilian award, the Honour of National Order. Style points: This Swiss miss is clean, diversified and regal. The flag imprint on the central bar is a nice touch as well. Romania’s number is just a boring and uninspired effort, but what would you expect with Joma as your sponsor? Undefeated in qualifying, a sense of optimism has swelled around a nation once proud of their English national side. Coming off a disastrous 2014 World Cup, in which not a single game was won, manager Roy Hodgson knew he needed to shake things up. A youth movement began, led by Harry Kane and 18 year old wonder kid Marcus Rashford. Wayne Rooney is the last man standing from the old guard, but his form has dipped considerably this season, making his starting spot anything but guaranteed. For a nation so rich with soccer history it is a shock that England have never lifted this cup, but this may very well be their best chance in a while. The Russian qualification campaign was a roller coaster most supporters would want nothing to do with. The 2018 World Cup hosts come into the Euro’s in disarray, as manager Fabio Capello was sacked halfway through, with CSKA Moscow coach Leonid Slutsky called in last June to rescue the campaign while continuing to coach at his club. The talent pool has nearly completely dried out since the Russians made a surprise run to the quarterfinals of Euro 08’, and not much should be expected, despite their modest improvement under Slutsky. Long suffering Welsh fans will finally get something to celebrate this summer, as their country will be making their first finals tournament since 1958. The weight of the collective nation will rest squarely on the shoulders of Real Madrid’s Gareth Bale, whose plethora of goals and assists in qualifying will be needed once more. Sure to garner most of the opposition's attention, players such as Aaron Ramsey and Joe Allen must step up. If they do, Wales has a real shot of reaching the knockout rounds where anything can happen. Back in the 2010 World Cup, little was expected from a side making their very first international appearance, but boy did they leave their mark. Slovakia advanced to the round of 16, knocking out defending champion Italy in the process. They started their qualifying campaign much the same, as Jan Kozak's side beat Ukraine away from home, stunned Spain and, in all, claimed wins in their first six games. Unfortunately, from that point on they failed to score in three games, and were only able to secure qualification after a tension filled victory over minnows Luxembourg. Which side will show up is anyone's guess, but if Hamsik and Skrtel are on their game, Slovakia could put a scare in any side. Style points: Not a great lot to choose from in this group, especially with England bizarrely incorporating powder blue sleeves , but Slovakia does OK. The colors are easy on the eyes and simple, keeping a clean look that can never go wrong. Russia's away jersey looks like a wallpaper you would find adorning an Eastern European brothel. By now, the stylist was probably poisoned. Once again, the Germans will come into another Euro tournament as one of the favorites, and it’s easy to understand why. The reigning World Cup champions bring back essentially the same squad that lifted the golden ball in Rio, giving manager Joachim Low an abundance of talent to choose from. Even so, some of Low's selection choices have raised a few eyebrows around Deutschland, particularly the inclusion of Andre Schurrle and Lukas Podolski at the expense of Julian Brandt and Karim Bellarabi. Marco Reus will again miss another major tournament through injury, which could come back to bite the squad this time around. After a runner-up finish in 2008 to Spain and a loss to Italy in the 2012 semis, now is the time for the Germans to claim their first European championship since 1996. One of the competition's real dark horses, Poland come into France riding high. Robert Lewandowski and Arkadiusz Milik led the most lethal attack in Europe through qualifying and, as a whole, the team is very well-balanced. Kamil Glik is a reliable center-back who can provide a threat on set-pieces; Kuba Blaszczykowski is spirited and offers great pace on the edge; while Grzegorz Krychowiak provides a towering presence who has been the heartbeat of a Sevilla midfield that has won the Europa League three years in a row. have to be made at a minimum in order to progress. The lowest seeded team ever to win their group, Northern Ireland ended a 30-year wait to appear at the European Championship. The forgotten ones (I like to call them the wildlings) of the British Isles have quietly gone unbeaten for over a year, invigorating a nation with optimism not seen since the 1982 World Cup side. Reality is surely about to hit them in the face come tournament time, but hey, stranger things have happened. Style points: Call me crazy but I’m digging this Ukrainian cluster f**k, and no, I’m not just trying to score points with my girlfriend. On the other hand, Germany’s risque experiment is a complete disaster. Gone are the fantastic red and black kits of yesteryear, instead replaced with some forest green that would be better served as camouflage. Group D is undoubtedly one of the toughest of the six groups, with all four sides currently within the top 30 of the FIFA world rankings. 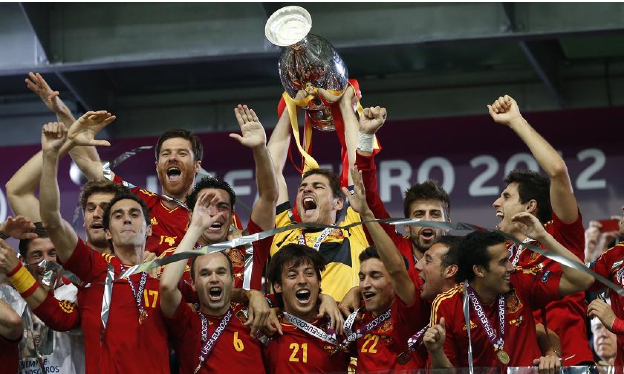 Although some of the aura has been lost after their shocking exit from the group stage of the 2014 World Cup, Spain are the back-to-back champions of this tournament so, until someone officially knocks them out, they have to be considered one of the favorites. Their midfield is still among the best in the world with names such as Busquets, Iniesta and Silva, and their defense is formidable with Ramos and Pique holding the line. Still, Vicente del Bosque does have issues between the sticks where David De Gea must surely be picked ahead of Spanish legend Iker Casillas, although locker room politics may determine otherwise. Then there is the small matter of who to go with up front given Diego Costa was not picked. Alvaro Morata is the likely choice, but his international performances have been anything but convincing. Fancied by many, Croatia come into the tournament as a universal favorite. The biggest reason -- their midfield. Luka Modric and Mateo Kovacic play for Real Madrid; Ivan Rakitic is a regular for Barcelona; Marcelo Brozović and Ivan Perišić star for Inter Milan. At the top they are led by Juventus’ Mario Mandžukić, a talented player who at times lets his emotions get the best of him. Perhaps their biggest question mark lies with their coach, Ante Cacic, who controversially dropped center-back Dejan Lovren from the squad due to “differences”. With all the tools to go far, Croatia should do very well, but a strong group of talented squads may have other plans. There’s just something about these tournaments that brings out the best in Turkey. They reached the quarter-finals in Euro 2000, took Third Place in the 2002 World Cup and the 2008 Euros, bringing a ferocity and win-at-all-costs attitude that intoxicates your neutral observer. The midfield is talented and lead by Barcelona playmaker Arda Turan, and one of the world's best free kick takers, Hakan Calhanoglu. However, it remains to be seen if the Turks possesses a striker within their ranks that is capable of putting the ball in the back of the net. Finishing in the top-2 of the group could prove to be a tall order, but an advancement as one of the 3rd place finishers is very attainable. Aside from captain and legendary goalkeeper Petr Cech, the Czech Republic no longer feature a host of names from the Premier League, La Liga or Serie A. Still, they managed to beat the Netherlands twice in qualifying to secure the top spot in their group in the process. Although able to score their fair share of goals, the Czechs' biggest weakness lies in the back. Their defense allowed more goals than any other team going to the European Championship, conceding fourteen times, mostly against inferior opposition. With these numbers, teams like Croatia and Spain won‘t have a problem to break them and end their hopes way too soon. Style points: It just shouldn't work, but somehow it does -- phenomenally. The wavy pattern, the blue stripe, the checkered socks! Croatia outdoes themselves once again, but how can they top it? This one hurts my soul, but my beloved Spain, what have you done? The white uniforms in the 2014 world cup were fantastic, but these look like a toddler got into the condiment section and decided to throw ketchup and mustard with no rhyme or reason. With arguably the deepest offensive attack in the tournament, Belgium are seen as the heavy favorites to win Group E. Possessing the likes of Romelu Lukaku, Kevin De Bruyne and Eden Hazard is enough to make even the finest defender blush. With crucial experience gained in the last World Cup this was supposed to be their chance for a long and prosperous run. Unfortunately, manager Marc Wilmots has been dealt a bit of an unlucky hand. First, captain Vincent Kompany was lost to injury. Then, one by one, Nicolas Lombaerts, Dedryck Boyata and Bjorn Engels all joined him on the training table. Toby Alderweireld and Thomas Vermaelen are both more than capable replacements, but any more injuries could spell doom for a side with so much potential. Manager Antonio Conte guides the Italians one final time before moving on to the club ranks with Chelsea. Italy surprised many in the 2012 edition, making it all the way to the final before being dismantled by Spain, but this time around the squad appears to lack much of the firepower needed to progress far. Only one player in the squad, Daniele De Rossi, has scored in double figures for the Italians. Midfielders Claudio Marchisio, Marco Verratti and Riccardo Montolivo are all out, putting even more pressure on a Juventus led backline expected not to concede many goals. On the brightside, the Azzurri still have Gigi Buffon providing a brick wall in front of goal. In what is likely the legend's last major international tournament, he will again attempt to will his squad on another deep Euro Cup run. All eyes will be on Sweden’s Zlatan Ibrahimovic as he may very well be playing his last tournament, as he is expected to retire from international football after its conclusion. The 34-year old still has the goods to get the job done, evidenced by his astonishing season for PSG in which he scored 50 goals. Sweden also have a crop of promising young players, but they will be playing in their first major tournament for the senior side. Six of them led the Under-21 side to European glory last summer, so they know how to play and win together, but this is an entirely different ballgame. With just one win in their past six games, Zlatan and the boys will have to hit the ground running or face an abrupt exit. Ireland, and their legion of fans, will swarm the shores of France with optimism and pints of Guinness. Manager Martin O’Neil will hope his lads brought their lucky clovers because they’re gonna need all the help they can get with this gauntlet of a group. What is significant is that Ireland only conceded seven goals in qualifying and took four points from world champions Germany in the process. Aging captain Robbie Keane will again be counted on to inspire a group that admittedly, must rely on set-pieces for goals and stout defense to have much of a chance. Style points: Italy gets it right (unlike England and the USA) by actually playing in the shade of blue present in their flag. The kit is simple, yet intimidating, with the focus squarely on the world famous logo of the Azzuri. Is this the Tour De France or the Euro Cup? Yes, Belgium is known for their prowess on two wheels and this get-up did normally drape the back of its champions, but that still doesn’t make it any less ugly. Much like Sweden, Portugal rely on a singular superstar to drive their team to victory. Cristiano Ronaldo is that man, and nothing will be more important come game-time than his fitness. The Real Madrid star looked well short of his peak in the Champions League final and manager Fernando Santos will be praying that he recovers in time. Other stalwarts such as Nani, Pepe and Bruno Alves will also be critical if Portugal are to go far. Fortunate to be drawn into one of the weaker groups of the tournament, Ronaldo and the boys should win the group fairly easily, even if not at their complete best. If there's a true under-the-radar darkhorse in this competition, it’s Austria. After drawing their first qualifying game against Sweden, they dominated their group winning every single game. Austria are disciplined and often defending in numbers, led by Bayern Munich left-back David Alaba. Their counter-attack can be deadly as well with the 6-foot-5 tall Marc Janko lurking in the shadows for a cross. His seven goals in qualifying were a god send for a team that lacks any traditional stars. With most of their players having played together for the better part of 4 years, Austria not only possess the chemistry, but the resolve to make some real noise. Finally, we’ve arrived to my favorite story of the tournament. Iceland are the smallest nation ever to qualify for the European Championship, but they're by no means the weakest. They beat Netherlands home and away in qualifying, and are the primary reason Arjen Robben and the boys will be spending their summer biking around Amsterdam. They kept six clean sheets in their 10 games and are led by not one, but two managers. Lars Lagerback and Heimir Hallgrimsson have forged a relaxed and spirited bunch that have enough talent in all three departments to produce the next 30 for 30. They may not be aiming for a top two finish, but that could all change if they hold Portugal to a draw, or win, in their first match. Getting to this tournament may not have been easy for Hungary, but it surely was eventful. They worked their way through three managers in qualifying, scored more than one goal in only two of 10 matches and somehow managed to lose to free-falling Greece. If that wasn’t traumatic enough, a playoff with Norway was necessary to achieve qualification in their first international tournament since the 1986 World Cup. Once the greatest team in the world, these have been hard times for the once magical Magyars of the '50s, but coach Bernd Storck has nothing to lose and neither does his team, making them a dangerous opponent on any given day. Style points: Unexpectedly solid effort from the Austrians with a different, yet non distracting pattern. I especially like the flags adorning the bottom of the sleeves. Portugal, on the other hand, has decided to go with a hue even Cristiano Ronaldo will be hard pressed to pull off.